My wife and I were living out of state when we started looking for a home in the Brainerd Lakes Area. We got into contact with Mark through Zillow and we are thankful that did. Mark was great throughout the entire home searching/buying process. 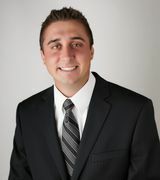 He has great local knowledge and has experience on both the real estate and mortgage side of the purchase. Mark's experience helped us out a lot while looking for our first home. If we ever decide to sell our home in the future, we will definitely go with Mark again. Thank you! Josh R.